The sketch of Norris, the baby of the Dowlin family, shows him at age three or four enveloped by the huge, ornate red upholstered chair he is sitting in. His blond hair cascades in long curls, and he is wearing the frilly white clothes that Victorian families often inflicted on little boys. Surviving photos of the “lost” final version of Norris’s portrait show that it was elaborately detailed, even to the point of making recognizable the story in the open book the child is pointing to—“Old King Cole.” A receipt for this painting, dated 1897, shows that Trego was paid one hundred dollars for the work. 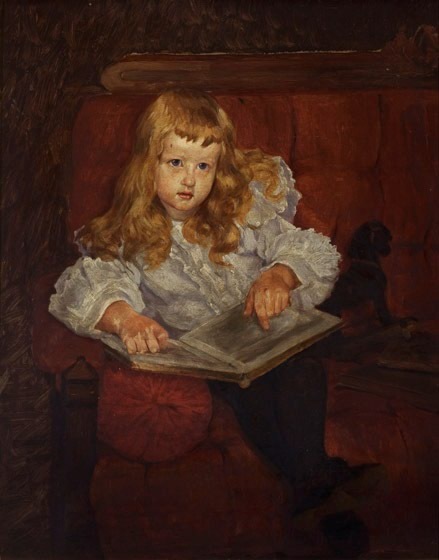 While Trego created oil studies of all three Dowlin children, he only completed a final version of this youngest child. The reason for this is unknown. From Luther Dowlin, who commissioned it, to Joseph Norris Dowlin, to one of his descendants. The painting is in general good condition, though in need of a cleaning.